Summer is right around the corner, although people have been saying that for weeks, and I’m beginning to wonder just how far away this corner is. But in the blind belief that warm weather – and an actual growing season – will be here soon, I’ve begun my annual routine of purchasing packets of seeds and planting them in tiny flower pots inside the house. 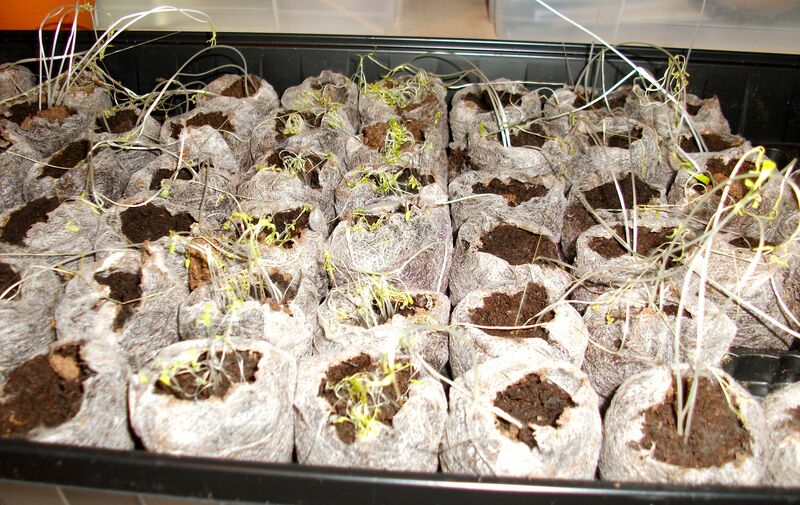 The theory, I’m told every year, is that you get the seeds sprouting, and by the time they’re big and strong and ready for transplanting, the ground outside will have heated and softened enough to provide a new home, where the seedlings can flourish. I don’t really buy it. I’ve been through this too many times, always getting my hopes up and imagining a crop that matches the lushness of the pictures on the seed packets, only to be disappointed again by flowers and vegetables that are pale, sickly, and have no identifiable will to live. And those are the ones that manage to poke their heads out of the soil. Most remain forever buried in a limbo of nitrogen-rich, well-aerated, moisture-controlled hibernation. Plants, I now suspect, don’t even come from seeds. But there are seed companies out there printing up glitzy four-color catalogs, and they need to sell something to cover their expenses. They slip a bunch of tiny, dry, flowery things into envelopes and we buy them, because we want to feel that we’re a part of nature. And because we never learn. Three weeks ago, I bought one of those seed-starter kits. It had a plastic tray with seventy-two little compartments, and an equal number of flat peat moss disks. Adding water caused the disks to puff up like you wouldn’t believe, and when they were completely puffed, I added various kinds of seeds – basil, tomatoes, cilantro, and some flowers, too. Even though I was sure nothing would happen, I put the tray onto a level surface where it would be warm, but not in direct sunlight, because that’s what it said in the directions. Keep out of direct sunlight! Keep the soil moist, not wet. Prune the branches every six weeks. Put the plant in the closet for fourteen hours a day. Take it out at three o’clock and let it watch All My Children, then set it on the windowsill, where it likes to wait for the mailman. After a low-sodium dinner and a non-dairy dessert, place the plant near a stereo so it can listen to the soundtrack from My Fair Lady, then return it to complete darkness for a restful night’s sleep. 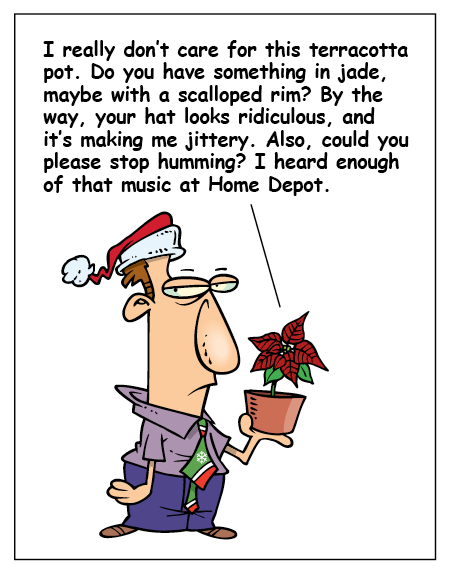 Remember that poinsettias can be upset by loud noises, violent shaking, or plaid shirts. Now I’m the one responsible for these delicate living things, so when it was time to start the seeds, I did what I was told. A few days later, I saw tiny things sprouting from the peat moss puffs. Nearly all of the compartments had something growing! The next day, the seedlings were twice as numerous, and much taller, and twenty-four hours later the tray resembled a small jungle. Meanwhile, outside, a thick layer of frost covered the lawn and the car’s windshield, as overnight temperatures continued to hover around the freezing mark. It would be at least two weeks before the little plants could be put into the ground. What happened next is what always happens. The baby plants, once reaching with vigor toward the ceiling and toward a future filled with salsa and spaghetti sauce, began to change from a soft, healthy green to a jaundiced yellow. Their thin stems became almost transparent and their budding leaves, once spreading like fingers, now seemed to change their minds and began to shrink. Then, as if bowing to some unseen authority, or despairing at the thought of a life spent under my ignorant care, most of them swooned and fell, face-first into the swollen peat moss from which they had emerged. A few of the plants, especially the basil, were still stubbornly deluding themselves into thinking it might be possible to elude death. In the middle of what looked to be a mass suicide, five or six young seedlings were still vertical, and green. If seeds waged war, this is what their battlefield would look like. I filled a half dozen of the larger pots with fresh soil and moved the survivors into them. I gave them a spray of water, enough to dampen the soil, and positioned them below the window, where light from the sun would find them only after bouncing off the opposite wall. Three of those basil plants made it through the night, and are still upright. They don’t look vigorous, exactly, but they’re alive. With any luck, they may one day claim a spot of their own in the garden behind the house, a special place where the ground has heated and softened enough to welcome and nourish them, and encourage their roots to drive deeper, even as their stems and leaves brave the direct sunlight and reach for the sky. It could happen. At least that’s what it says in the seed catalog. And I didn’t have to scrape ice off the windshield this morning. Maybe summer is right around the corner, after all. my success this year is i gave up and am worried the birds and animals who eat everything that does grow will be depressed . However , i am enjoying sitting in my lounge chair and having the time to comment on articles like this . Giving up is sometimes a good approach, Bert. I’ve noticed in the garden that things grow best when I stay out of the way. Thanks for the comment. PS – I was never good at keeping plants alive on the east coast, either. I have been more successful in CO. I’m not sure why, though. It’s probably time to go to the nursery and pick up a few basil plants. But the garlic is growing (planted last fall). That’s interesting about the plants growing better in CO than NY. More altitude, less attitude? It is very interesting.Thank you. Thank you for reading the post, Ranu. Nary a single bulb that I planted last fall came up. I’m not doing vegetables until I retire to Salmon Arm where my daughter already has thriving flower and vegetable gardens, as well as 25 chicks and 3 goats. I now plant perennial shrubs and flowers to take the guess work out of spring. During the recent frosts I had to swathe the gardens in bed sheets and plastic. I also have lots of potted flowers around the yard. Gardening is an art my friend. The thumb is either green, or not. Thanks for the morning smile. Same problem here with the bulbs from last year — nothing came up. This refusal of seeds and bulbs to grow always makes me think of weeds, such as dandelions, that spread like crazy with no help or encouragement. I cut the lawn on Saturday and on Monday the dandelions were standing ten inches tall and the flowers had already gone to seed. Does anyone know how they do that? Is the medical profession studying these things? I think we can learn something. Even stranger which attests to the resiliency of dandelions is how they came out of the frost completely unscathed while the flowers I covered so carefully with bed sheets and plastic still took a hit……. I’ve learned to scalp the grass early on to avoid having to look out at a sea of yellow…..
We have similar trays of hope resting optimistically on a window ledge in the shadow of gray skies and cool raindrops. Fortunately I am content with the smiles our sprouts produced even if there is no fruit to validate our labor. My wife is very successful at starting a vegetable garden. Then, one day she’ll announce, “I think the strawberries will be ripe tomorrow.” The raccoons in our neighborhood must have our house wired because in the morning the strawberries will be gone. We’ve planted a lot of vegetables but the critters seem to get the better part of our crop. We have tomatoes, cucumbers, and something called chocolate mint that smells wonderful. All are doing well. However, I think I killed my rosebush, which pisses me off as it cost me twenty bucks. We also have a very young peach tree which might have 3 peaches on it if we’re lucky. I blame the squirrels. Matter of fact, I may just blame them for the rose bush too. Stupid squirrels. Our peach trees are now six years old and we’ve never seen a single peach. On the trees, I mean. A squirrel came to the door the other day and wanted to know what was going on. Oh, Charles! Silly man. Don’t you know you’re supposed to let them watch Guiding Light at 2 pm? This was so brilliant, hilarious and also sad. I weep for the dying tomato. (great little videos!) Actually, I weep every year it’s time to start the garden again. How much death and destruction can a person take, I ask you? P.S. I’m with Jac, your optimism line was perfection. There seems to be a sharp difference of opinion over which soap opera the poinsettias prefer. See? We think there’s nothing left to discover, but we still don’t know a lot of things. Tell me the truth, Darla: Do I have a future in animation? Well, I think it’s spectacular! But then I can’t see very well. Maybe ask your good buddy Angelo? I could. But he’s a liar, too. Thanks, Ann Marie. It’s good to hear from you. I’m fairly accomplished with seeds, but have yet to plant a ranunculus bulb that turned into more than mole food. If you’re shaking your head saying “What’s a ranunculus?” now you know why you don’t know what! I never try to grow anything that I can’t spell. I’m finished with seeds, cat. From now on, I’ll let the nurseries do the hard part, then I’ll buy their adolescent plants. I still have to remember not to step on them. That takes skill, too, doesn’t it? I loved this! Have you ever tried feeding the seedlings with Miracle Grow when the start coming up? Maybe that would help? I feel for you – I could grow a stick stuck in the ground in Oregon (honest! I trimmed the first 1/3 of the limbs when I planted my new apple tree, stuck them in the ground . . . and they grew!) Here in Colorado? I can’t even grow grass . . . I have a lovely patch of dandelion and nettle, however. Sigh. I really really miss my garden! That Oregon-Colorado things is interesting. See my sister Jac’s comment above — especially the PS. Will you remind me again next spring? Brilliant Charles. And the death of the tomato plant? Natalie Portman couldn’t have done it better. I’ve never bothered with seeds, but my husband laughs hysterically whenever I bring a basil plant into the house — which I need to do every few weeks. One way or another, our basil plants will be growing like wild by mid-August. I doubt they’ll be from the seeds, though. I love this and I empathize. Last year, my lily bulbs didn’t die, but nor did they blossom. This year, they’re already quite tall but haven’t any buds. At least not yet. Still, like you, I am hopeful. I am an optimist. Maybe the secret is to appreciate the miracle that occurs whenever something does grow, rather than expecting it to happen every time. Although when I drive past a farmer’s field that has millions of little plants coming up out of the ground, I have to think I’m doing something wrong. Okay, I’m going to plant the rest of the seeds directly into the ground tomorrow (the 11th). But I’m also going to get some small established plants as back-up. I’ll report back to you in a month or so. I did talk to them, but it turned out to be more of a seance. I was going to pop in and offer advice, but I see you already have 29,000 comments, so… no, wait… most of them are not advice. Forging on! I too have used the starter trays with the lil peat pellets that go swoomph and provide “an ideal growth medium for your seedlings” – except they aren’t. I’m not a botanist either but I’ve spent the past three springs starting hundreds (and I do mean hundreds – I buy the pellets by the CASE) of seedlings. There are two problems working against you. One is that peat has little nutritional value. It’s like you trying to exist on a diet of Ramen noodles without the broth. I fix this by making a broth. I take an empty juice bottle large enough to hold the water needed to expand the pellets, fill it with water and add about a tablespoon of slow-release plant fertilizer – looks like tiny colored balls. Let that sit for about two days to dissolve some of the fertilizer into the water. Put your peat pellets in the tray, pour the water through a strainer into the tray (the strainer catches the un-dissolved fertilizer balls so you can use them again) and watch the pellets go swoomph. Now your peat pellets have some nutrient value. Once the seedlings sprout they tend to get tall and scrawny fast (called getting “leggy”) mostly because of lack of sunlight. Yeah, I know: “they” said don’t place them in direct sunlight because they’ll scorch, and they will. But the poor lil darlins need more sunshine than they get just sitting around on the average kitchen counter. A grow lamp is the simplest solution. Otherwise search out a window where you can get some sun but not be sitting in a blast furnace. A cloudy day is perfect. Sheer curtains help filter the bright sun. You can make a sun filter from a piece of sheer cloth that hangs in the window from suction cups. Or you can just set them in the window early mornings and late afternoons and take them out when the sun beats in strongly. And yes, it’s now Guiding Light, not All My Children. Allan, I knew you’d have some good advice. But why didn’t the company that makes the tray and the peat moss things ever think to include a little broth? I’m going to plant the rest of the seeds outside. But everything you said makes sense, and I’m going to remember it the next time I try to grow anything indoors. Thanks. Ha ha. I’m sorry your idealism has been beat down to optimism. BUT, I’m even more sorry that you draw as well as I do! (Great video) Maybe the farmer’s market and the seed companies have a pact to implant plant poison into the seeds which bursts at just the right time to stunt their growth and thus keep you returning to the farmer’s market. Those seed companies are selling a lot of seeds, aren’t they? You’d think everyone else would have caught on by now. And thanks for the compliment about my drawing, Sandra. I don’t believe you, but thanks anyway. Reblogged this on FedUpYours' Blog. Thanks, Shimon. And it’s always a pleasure to read your reaction. I just completed my Master Gardener course, so I am an expert in telling you that you did everything exactly correctly. Except for the TV show you allowed your plants to watch at 3PM. Doesn’t it say on the package that plants do not like soap operas and have been known to develop root rot at the sight of them? Try the Katie Couric show instead; you’ll have excellent results or my Master Gardener’s certificate is worthless. 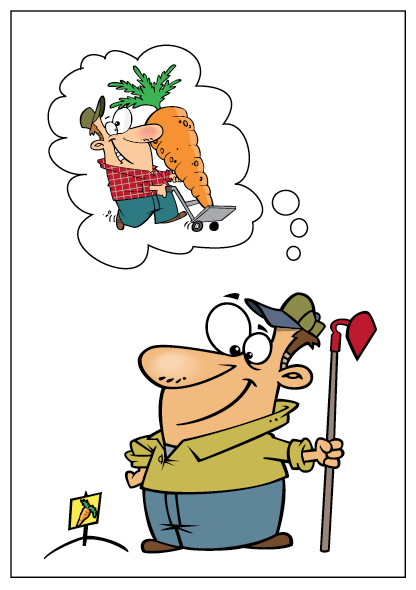 You’re a Master Gardener? Do you wear some kind of robe? What color belt do you have? Oh no! How dissapointing!!! Why don’t you just get some ready to go tubestock from the local nursery or, even better, ready grown plants you can just dump unceremoniously straight into the ground once it has defrosted enough to hack a mattock into. Also, perhaps your seedlings DO need direct sunlight. I think that could be part of the problem. Also, don’t overwater them or that can lead to their demise, too. I had to look up tubestock and mattock, too. And yes, that’s exactly what I’m going to do. In fact, that’s pretty much what I do every year. I just keep forgetting how it went the last time. What a hilarious and hilariously pitiful post! What the heck happened? Did you walk away from your little charges for a second? To go to the bathroom, to eat? Don’t you know you’re supposed to bed down right next to them, give up your activities of daily living and devote your life to the little ones? Hell. Charles, go buy starter plants. Forget the seeds! What torture! I started my garden earlier than anyone in Idaho this year. I lost a tomato plant to frost and some peas to direct sunlight, but my feeling is this: If they can’t do the bulk of the work in surviving my care, then the hell with them. I’m a no-nonsense gardener. You’re right. It’s time for some tough love. Anyway, they sell all that stuff at the supermarket. It’s already grown and picked, and I don’t have to deal with the guilt because I accidentally cut a worm in half. Now you’re talking like a true gardener. Good for you, Charles! I, too, am a seed-to-plant believer and delude myself every year by purchasing seeds, hoping they’ll grow into something that doesn’t become an excuse for a blog post (ahem!). What’s more discouraging is planting tulip bulbs in the fall only to see squirrels haul them off one by one. Incidentally, squirrels are always very plentiful, but they don’t sprout from seeds in the ground. Food for thought, but no food in my garden this year. Thanks for getting me thinking about what a big failure I am with gardening, Charles! Sorry for the reminder, Susan. But maybe you’ll have better luck now that you’re back in this hemisphere. I duplicated this exercise in hope and futility for years, until finally we went out and got a grow lamp and a fan. Uncover the trays as soon as the first hints of green appear, and turn on the fan and grow light. You have to water every day, but the moving air keeps the surface of the soil dry to prevent damping-off, and also keeps the plants moving to strengthen their stems – a nice little core workout for your babies. Good luck, and thanks for a hearty (but rueful) laugh! Thanks for the advice, Diane. I have a feeling that I’m one of those people who over-waters plants out of fear that they’ll dry up and wither away. The result, I guess, is that they drown and wither away. Your optimism and perseverance are commendable. I get my herbs when they are already in their adolescent phase…much less care but still quite moody. Good luck! That’s what I’m going to do from now on, Michele. Seedlings require more knowledge and skill than I have. Thanks for the comment. Charles, I am so sorry for your annual and much misplaced optimism but your animated tomato plant is an absolute star and I hope it has a long, successful career! Patti, I appreciate your much-exaggerated praise for my animation work. There are tricks to using the software that would make the finished product look better and run more smoothly, and it would take less time. Unfortunately, I can’t seem to learn those things, either. 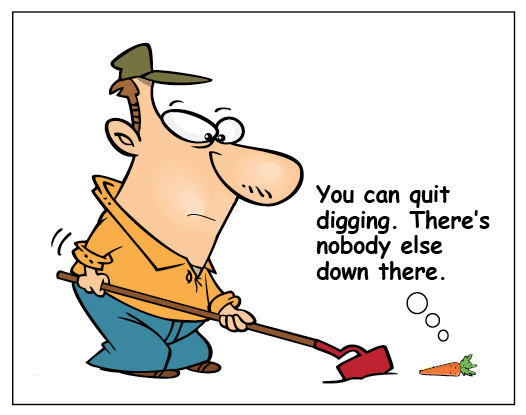 While your future as a gardener might be in jeopardy, you definitely have a shot at animation. Love the tomato plant. Yes, it’s a very sad story. And, yet, hilarious. I can identify with you pain, Charles. I once killed a cactus plant. I’ve killed more than one cactus, Judy. In fact, when my daughter went to China a few years ago, she left her cactus plants in my care. I was a nervous wreck. They survived, but only because she was back within a year, so I only had to water them a few times. 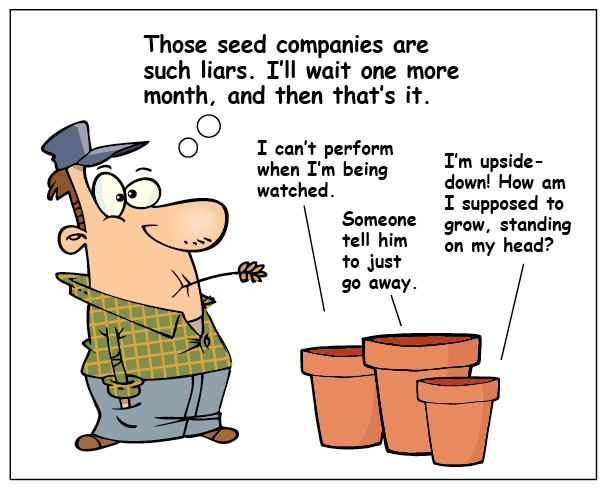 Omg, I was so happy for you when your little seeds started sprouting. But you know, the same thing happens to me with the seeds indoors, start off promising, but then wither away. So strange. Someone up there said to plant directly into the ground, I agree. Also…I do recall you telling me you were going to plant sunflowers this summer…you really do need to do that, they will make you feel optimistic and even idealistic again. I love the pointsettia bit. I’d forgotten about the sunflowers. Thanks for reminding me. I give you credit for even trying. I gave up years ago. There are no green thumbs in this household. But isn’t it amazing how successful some people are at this? It’s as though the plants know who’s raising them. Remind me to tell you about my “English Country Garden” sometime. Charles, your post really cheered me up. I thought I was alone. Succulents are the answer (well, for me they are the answer). I ignore them for months at a time and they refuse to die. Good old loyal succulents. We received an aloe plant from a friend last year. Her living room looks like a rainforest, with huge plants everywhere, all looking thrilled to be alive. She has an aloe the size of a laundry basket, and gave us one of the babies because she was running out of room. The baby aloe was dead within three months. Now what do you have to say about those good old loyal succulents? I am great with seeds, it’s the mature plant that gives me trouble. Once it is outside and away from my tlc, there’s no protection from whatever occurs that makes it bolt, or wilt, or get taken over by weeds. Yikes. You don’t want to know what happened to my pumpkins. Maybe I should send you the seeds, and then when they’re out of danger, you can send back the young plants. And now I do want to know about the pumpkins. OK, here you go. Practical advice. A good friend begins every gardening season by going to yon garden store and buying one of everything that’s already growing. She takes them all home (veggies and flowers alike) and puts them in her back yard. About twice a week she hoses everything down. At the end of two weeks, she goes and buys more of whatever thrived under her “care”. As she puts it – if those babies need pampering, they don’t need me. I’ve seen the proof, Linda. The plants and trees that do well are the ones I leave alone. I often think about fields of wildflowers, or the miles of healthy trees I pass on the highway — no one waters or fertilizes them, no one protects them from insects and weeds, and there they are, just fine. I’m done with seeds. That’s it. I mean it this time. No. Done. I’ll never touch another seed. OMG, this was great. I can so relate. I’ve always claimed 2 black thumbs. Even dandelions shudder when they see me coming. (Of course, the grass around them is already dead, so w/o dandies, I’ve got plain ol’ dirt.) This year, for some foolish reason, I too, tried planting a garden. Oh my joy when little things started sprouting. Oh did I care for the little dears, covering them at the slightest hint of a late frost, loving them, talking to them, (I’ve heard plants like that, although no one else seems to). Things were going along just great until I noticed my carrot tops looked kinda strange. All curled up, like they were clutching a belly ache or something. Upon investigation I discovered they were clutching an astounding crop of aphids. Yuk! Ok. So supposedly you can rinse aphids off with a hard spray of water. Don’t believe it. You may wash away the budding plants, but the aphids will crawl right back to attack whatever’s left. Oh. It’s hopeless. I wish you far better luck than I have had. BTW, those little videograms (or whatever they are) terrific. A new talent you’re developing? My animation talent is on the same level as my gardening skills, Linda. But if you need any advice about raising huge, healthy dandelions, just let me know. I’m not sure what aphids look like, but we’re blessed with an abundance of slugs here. Do you have those adorable creatures? I have to admit that I’ve never even tried planting or growing anything, so I can’t even tell you if what you did is normal or not. And isn’t basil something some people eat (I don’t know if I’ve ever eaten it but I know if I did it wasn’t on purpose)? My guess is that you’ve eaten basil and didn’t know it. When I make spaghetti sauce, I always throw in a couple of leaves. It adds a great flavor to the food, and then takes on the flavor of the sauce itself. So once it’s all cooked together, the basil doesn’t really taste like basil anymore. You should try planting a small vegetable garden, Mitch. If nothing else, it’ll help you appreciate the supermarket a lot more. Waiting for mailman haha. I really liked that whole para about your mother’s plant. Thank you, Sara. I’m glad you liked it enough to comment. And enough to reblog it, too. Thanks again. I often thought that one of the most profound challenges of life is to live between what is and what we think should be. So many of us get chewed up and spit out by the vast distance between these two poles of life. I make it my personal challenge to live within this tense balance every day of my life–never letting go of what should be, but unafraid to live with what is. I loved your parenthetical comment: Actually, I’m an idealist who’s been beaten into submission. Optimism is just where I hit the floor. That might just be me too. I’ve also tried to make that my personal challenge — to keep working to make things better (whatever that means), but at the same time, to be happy with the way things are. I’ve failed in that attempt, mostly. I say that there are a handful of exceptions to the gardening rule. If you managed to murder a succulent in a matter of months, then you belong to that cohort of black thumbs who dare not speak their name. I beg you to stay well away from the garden. It wasn’t murder, exactly. It was more like involuntary plant-slaughter. Love that video and I also feel sorry for the worms. Thanks, Bruce. Animation — even mediocre animation — is a lot of work. But I appreciate the kind words. Sorry to rub it in but I have something of a green thumb. Even here, on a desert island, I am growing things. I guess it’s to do with attitude: I have never subscribed to the division of plants into desired ones and weeds. If it grows it’s worth growing, period. Just keep trying, and if you sow enough seeds, chances are one or two will survive and type the complete works of Shakespeare. Too late, Sandra. I have officially given up on seeds. In fact, I’m off to the nursery this afternoon to buy some basil and tomato plants. By the way, one of the nicknames for the place in Canada where I live is the Garden Province. Now that’s rubbing it in. I have made a bold decision! Next year I will refrain from starting plants indoors. Yep, I’m just gonna wait till it’s warm enough outside and give those seeds some tough love. Though it would be lovely to blame our soil or some such thing, one cannot deny the abundance of green things growing all around without any intervention or assistance from me. I’m thinking my gardening strategy should be to take the seeds, dump them all in a bag, give the bag a shake, and then fling those suckers, hoping for the best. 😉 I hope your herbs make it! Every time I see a field of wildflowers, I think about the wisdom of just leaving nature alone. Things work better when I stay out of the way.